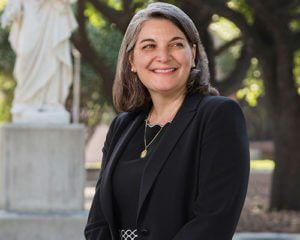 The Center for Catholic Studies was formally established with the hiring of inaugural Beirne Director Alicia Cordoba Tait, D.M.A., who joined St. Mary’s in 2018. Tait was previously at Benedictine University as the Director of the Center for Mission and Identity. As the Beirne Director, Tait guides the University’s ambitious mission to become a hub of exploration into the Catholic intellectual tradition and its impact on knowledge, culture and faith. She also works with groups across campus to support activities that integrate the Marianist heritage of the University and the mission of the Center. This endowed position ensures that Catholic studies remains a priority to the mission at St. Mary’s and furthers Catholic intellectual thought among faculty, staff, students and the community. It is an honor to serve as the inaugural Beirne Director of the Center for Catholic Studies at St. Mary’s University. I have felt very welcomed into the community. As I continue to meet the community and talk about ideas for the Center, I am energized and excited about the potential the Center has to build on the compassionate, caring environment here and obvious love of the Church I have already seen so vibrant throughout campus. I look forward to continued conversations as we, as a community, plan, create, and inspire the good works of the Center to fulfill the Catholic Marianist mission of the institution in forming a community in faith, one that believes in excellence, and provides students with an education that promotes professionalism, integrated learning and leadership for the common good.